E-Capcom have begun taking pre-orders for a collection of 8-bit themed card sleeves, designed to keep all your business cards, trading cards and the like nice and organized. Two volumes are being produced with 50 sleeves in each. Both sets are going for a cheap 525 Yen, or roughly $5.76,and are slated to ship out to customers August 6th. While the sleeve collections is currently exclusive to Japan, don't be surprised to see these pop up on import shops or even Ebay in the near future. Nice. 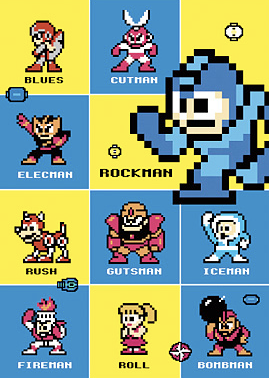 On a side note, though, since they went through the trouble of adding Proto Man, who wasn't even in Mega Man 1, I think it would have been nice to see 8-bit sprites of Time Man and Oil Man, too, but maybe that's just me. Capcom already forgot Oil Man & Time Man. Business card sleeves? Do these fit trading cards? How durable are they?